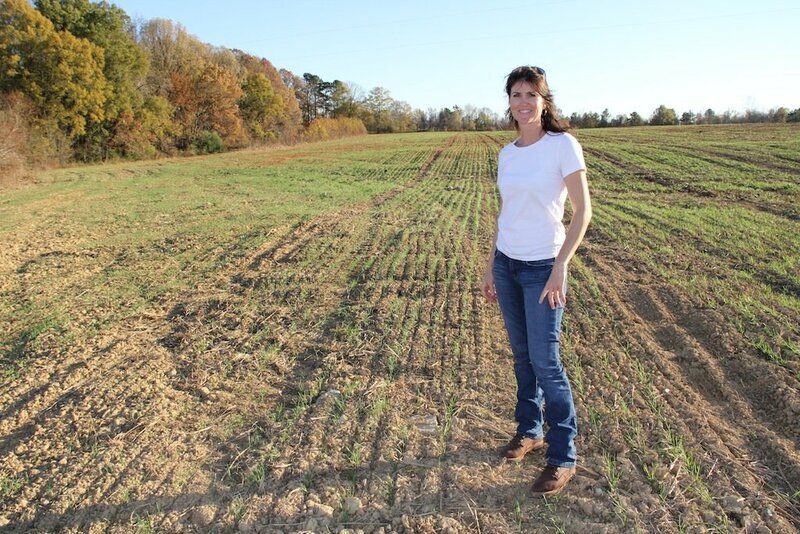 RAFI BOPS Coordinator Kelli Dale at an organic wheat testing plot on Lindale Farms in Chatham County, NC. In the spring of 2009, North Carolina State University and RAFI embarked on a project to develop field crop varieties specifically selected for organic production in the Southeast: BOPS. Connecting Organic Farmers and Breeders: The BOPS coalition is a networking project bringing farmers and breeders together to inform the work of the BOPS breeders, and bringing farmers together to better understand the challenges they face in using organic seed in the southeast. Testing Field Crop Varieties: NCSU’s breeders will test varieties of Soybeans, Corn, Wheat and Peanuts for traits advantageous to organic systems in the southeast. Their research goals, and the varieties they test, will be determined by the needs of southeastern organic grain farmers. What Does the BOPS Coalition Do? This project will initiate an annual event that will bring together plant breeders and organic farmers from around the Southeast. Crop breeders, organic producers, Extension, and researchers will come together to focus on organic crop breeding at the annual meetings. The current work of the BOPS breeders will be discussed, along with the needs of farmers, the market demands and opportunities, and the opportunities the breeders see for innovation. Between annual meetings the coalition advocates for increased resources for public plant and animal breeding, and keeps channels of communication open between farmers and breeders. Why Public Plant Breeding? Currently, the overwhelming majority of breeding is done by private industry with the use of pesticides, and for corn and soybeans with transgenic technology. Pest management challenges specific to organic production are not addressed in these breeding protocols. Organic producers are often pressured to use varieties inappropriate for the Southeastern climate or pest populations because of limited seed options permitted under organic certification guidelines. As public breeding efforts continue to shrink while private breeding and use of patented genes expand, available germplasm for organic producers or even non-GMO producers is limited and often outdated. There is a great need to expand public breeding programs to address the regional needs of non-GMO and organic producers in the Southeast USA. Farmers that assisted in the development of this organic breeding project have identified several limitations to currently available varieties for organic production of soybean, corn, wheat and peanut. Looking to buy your own organic seed? Find what you need online at the Organic Seed Finder. Click here.